For around £250.00 you can experience the Crossfade’s award-winning signature sound, which can be streamed both in wireless mode or via Bluetooth. There is a built-in hidden microphone which has been specially optimized for hands-free phone calls and voice recognition commands, plus the Lithium-ion battery offers up to 12 hours of continuous use and can be fully recharged in less than 2 hourse using the included V-Micro USB cable (plus you can use the headphones in analogue wired mode for as many hours as you like). These V-MODA Crossfade Wireless headphones use the same dual-diaphragm 50mm driver as the award-winning Crossfade M-100 and provides incredible speaker consistency thanks to perfectly balanced air flow and materials. The phones themselves feel luxurious and expensive, made from a combination of steel and vegan “leather”, with memory foam cushions and headband for extreme comfort even when in use for extended sessions. Wireless audio via Bluetooth technology gives users the ultimate freedom, but unlike most wireless headphones, just by inserting a cable plug into the headphone jack you can achieve zero latency by switching off all the electronics – perfect for gamers and DJs. You can pair the Crossfade Wireless headphones to any Bluetooth device up to 10 meters, plus you can even pair with two devices at the same time. The built-in hidden microphone is worthy of special mention too, it’s been specially tuned and a rugged Kevlar-reinforced cable is included in the box. 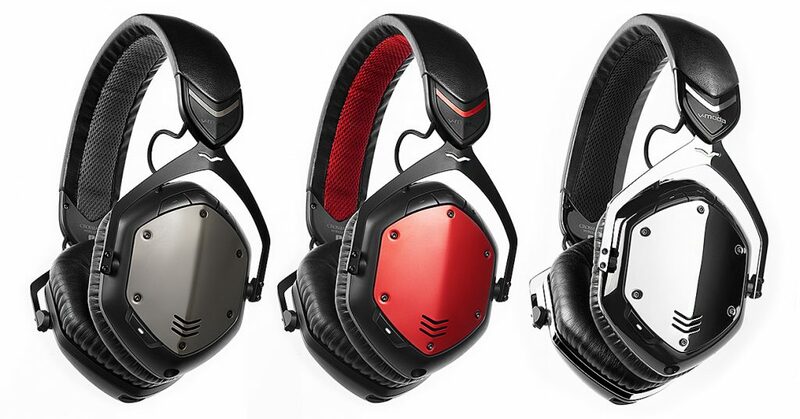 The Crossfade Wireless headphones meet military-level standards of the MIL-STD-810G testing with memory foam ear cushions to physically block noise and the SteelFlex headband which adapts to your head and ears to create perfect noise isolation as well as an immersive 3D soundstage experience.